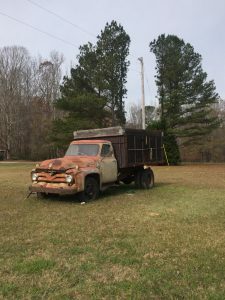 At first glance, this rusty old truck might seem to be just another hunk of old iron. In reality, it’s a piece of Fayette County history. A man named Stick Biles was its driver. Once its stew days were over, the truck then went to Vernon Woods, who put a dump bed on it and used it on his large grain and poultry operation in Brooks. The truck sat in Travis’s barn for most of the years since. Having known that truck since Vernon used it, I occasionally inquired about buying it. Out of the blue, on a recent ride home from a Towaliga Soil and Water Conservation District meeting, Travis said he’d part with the truck. Our friend Johnny Brown hauled it home on his rollback. After draining the gas tank, installing a new fuel pump, points, condenser, coil, a few spark plugs and wires, the old 272-cubic-inch Y-block engine was running again. A few short test drives – still no brakes at this point – indicated an overheating problem. Removing the thermostat didn’t help, so off with the water pump, which led to the discovery of a shattered impeller. That engine has the rare “high fan” setup, where the fan bolts to a bracket that is part of the water pump housing. Since no replacement can be found, the water pump has been shipped to a parts rebuilder who is looking for an impeller. It’ll be running and driving – and stopping- before long, but the old truck probably will never be a showpiece. It will, however, be shown, at our Inman Antique Truck Show on Father’s Day weekend and at Inman Farm Heritage Days on the third weekend of September. And maybe one day my granddaughter Abigail Adamek, who already seems to have an affection for old iron even at her young age, can drive it back to the old Mask and Gay complex. She’s quite familiar with that place. Her dad’s DRG roofing and gutter business is in the old “chicken house” building on the stew plant property. How’s that for an historical tie-in?